Our 2019 Mary Baker Rumsey Award recipient is Myrla Pierson. Myrla Pierson was born and raised in Oklahoma City. She graduated from Putnam City High School and The University of Oklahoma earning a marketing and public relations degree. Myrla worked as a travel consultant for 28 years and managed the agency for five years. She also taught travel courses at Oklahoma City University and Draughn Business School. Myrla started volunteering at the age of twelve by becoming a candy striper at Baptist Hospital where she realized a passion for devoting time and energy to helping others. As a young person, she enjoyed going to camp and later became a camp counselor. Myrla committed herself to making a positive impact on civic and cultural life in Oklahoma City while holding down a full-time job. As a member of Junior Hospitality Club for five years, she served on the auction committee and made hundreds of fundraising submarine sandwiches at the State Fair. 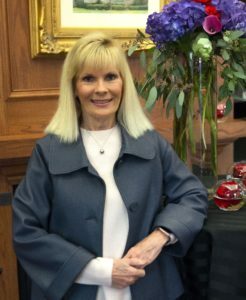 Myrla joined the Junior League of Oklahoma City in 1988 and fulfilled many community placements along with serving in executive and board positions. As an Active member, she served as Placement Vice and Chair, Membership Vice President, Nominating Chair, Bylaws Chair, President Elect and President. She has served on the Membership Council as a Sustainer, multiple committees, task forces and as Sustainer to the Board of Directors. Myrla enjoys being a Sustainer in an organization that impacts young women’s lives through effective action and leadership of trained volunteers who promote volunteerism and improve our community. Using her Junior League training Myrla, served on the St. Anthony Foundation for six years. She co-chaired the Saints Babies Luncheon which raised funds to purchase equipment and beds to deliver babies in a hospital room. She served on the Saints Ball committee for five years which is the Foundation’s signature fundraiser. Myrla co-chaired the Multiple Sclerosis Luncheon to raise money for research and development. She was a member of the Multiple Sclerosis committee for over ten years, working in various positions. Myrla volunteered at the Oklahoma City National Memorial and Museum where she served on many committees over a fifteen-year span. Her primary responsibilities were planning and fundraising for the Reflections of Hope Award banquet. She co-chaired two of the dinners with her husband, Gary. She was also proud to participate for many years in the OKC Memorial Marathon. Not only did she run in many marathons, she worked as a volunteer and hoped that she could make a difference to someone who lost a family member, friend, or worker. The OKC National Memorial Museum is the sole beneficiary of the Oklahoma City Memorial Marathon. Myrla has served on the Chi Omega Advisory Board for over fifteen years as the alumnae relations advisor and the initiation advisor for alumnae. She co-chaired the Chi Omega Fashion for a Passion style show to benefit Hearts for Hearing. She has enjoyed mentoring college women and helping them with organizational skills and community volunteering at the University of Oklahoma. Myrla was honored with the Greater Oklahoma City Alumnae Panhellenic Foundation 2002 Chi Omega Woman of the Year award. Myrla is also committed to the Juliette Low Leadership Society which supports Girl Scouts by raising funds for the benefit of for girls throughout western Oklahoma. In addition to co-chairing the luncheon in 2013, she has served on the sponsorship committee for nine years. The 2013 luncheon committee and staff raised nearly $285,000 to provide programming in leadership, personal development and essential for life skills to many Oklahoma Girls. She is currently co-chairing the Capital Campaign for “Camp the City,” which will build a STEM camp for Girl Scouts to allow them to explore science, technology, engineering and mathematics. This camp, just east of the lake at the Oklahoma City Zoo, will serve not only Girl Scouts but all girls and the public. Other organizations that Myrla has served as an executive, board or committee member include: Allied Arts, Ballet Oklahoma, Friends of the Chamber Orchestra, Arts Festival, Symphony Show House, Casady and Heritage Hall Schools, Hearts for Hearing, Wes Welker Foundation – Cleats and Cocktails, the Alzheimer’s Association and Make-A-Wish. Myrla has been married to Gary for almost 30 years and they have supported each other in their community involvement and careers. They have one son, Nicholas, who will soon graduate from the University of Oklahoma College of Law. They are members of United Nichols Hills Methodist Church where Myrla has served in many activities, including Sunday School teacher, altar guild, and Vacation Bible School as well as various Bible studies.